This unique single family home was completed in June 2008. It's impeccably furnished/maintained! It has great appeal for people traveling with handicapped guests. 2 out of the 5 bedrooms are master suites. On the 1st floor, up a ramp from your private parking area that easily fits four vehicles is a 'handicapped accessible' master suite which includes a full bathroom with a glass & marble shower. This suite has many of the normal handicap amenities along with a California King size bed. The other suite is on the 2nd floor & includes a king size bed & a twin bed for the child who might still need to be somewhat close to mom/dad, a spectacular 'huge' bathroom with a sit down glass/marble shower & a deck. There's a 2nd bedroom on the 2nd floor with a queen size bed, a full bathroom and a 2nd living room which includes a VERY large plasma TV, a leather sectional sofa & chair & a porch with table and chairs. The 3rd floor has a full bath with 2 bedrooms; 1 with 3 twin beds & a 2nd with 2 sets of bunkbeds, a trundle bed & a full sofa futon. This room also enjoys a deck with a breathtaking view of our famous Ocean City ferris wheel all decorated with beautiful state of the art led lights. Three rollaway beds are also included which could be placed in any of the rooms for a comfortable nights sleep. I also included three air mattresses for those additional guests who just pop in for the beach and a place to crash. I appreciate the high level of family oriented spirit that only Ocean city, NJ brings to a family vacation. I have been coming here for the past 50 years so I can speak first hand on the high level of attention the town has continued to invest in keeping the 'family values' theme throughout every aspect of your upcoming vacation. My home is quite unique as compared to all others in the same neighborhood. First of all, it's a large, newer single family home which is rare to find these days. I am pet friendly and handicapped assessible because our four legged friends are very important members of the family and our most 'seasoned citizens' often like to gather the entire family together at one time but they also need that larger home with no steps for themselves. In most transactions I try to keep the paperwork to a minimum so I don't normally require a security deposit. There is an outdoor shower to remove sand before entering the home. This property is located one block from the boardwalk & beach. I have a refrigerator in the main kitchen and another very nice refrigerator located inside the garage. First class public tennis courts are located 100 yards from this home. This property is perfectly suited for any person who can not handle any steps whatsoever. There is a ramp from the back of the house where the private parking is located and leads right into a double set of doors into the kitchen A master suite is located immediately to the left with a king size bed and many handicapped accessible features in that self contained bathroom. 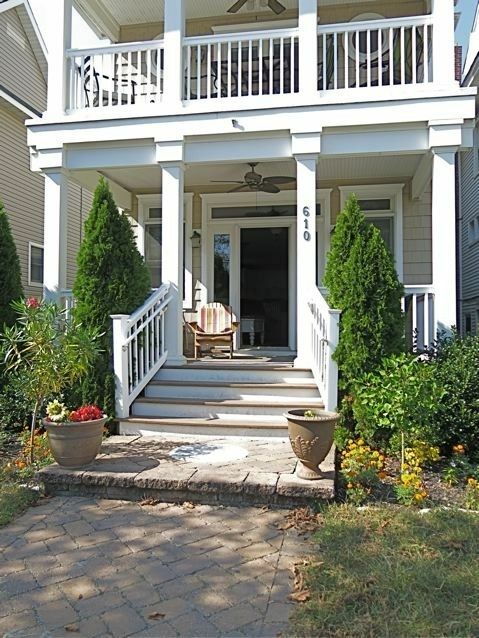 No steps to the dining room, living room or going outside to sit on the front porch. Additional Amenities: WIFI through entire house. Weber gas grill, Eddie Bauer Pack n' Play, 14+ bikes in great condition, boogie boards, beach chairs & umbrellas, beach toys and crab traps. We also provide sporting equipment for the local tennis courts and basketball courts as well as many other toys for the beach and the house. Requested this place about 2-3 weeks before arrival and ran into some money issues. Dan was very patient and stayed in contact until I could fix the issue. Beautiful home right by the boardwalk. House was very clean, no problems at all. Definitely would recommend someone to stay here. Thank you for all the kind words and for the manner in which you treated my property during your stay and the very nice condition it was left upon your checkout. I’m so glad you and your family have already booked again for next year. It was very spacious and so much bedrooms. The house alone is amazing and will be returning. Very convenient to AC!! Dan's house is great for big groups like ours. We had 10 people, but it could sleep 14. The house was clean, nicely decorated, and well-stocked with glasses, dishes, etc. Dan was very responsive. There were just two problems - we saw a mouse (Dan addressed it immediately) and the shower in the upstairs master bedroom had no way to adjust the (very) hot water. I would stay here again in a minute. I thank Rick and his guests for being very respectful of my property and just a wonderful pleasure to have as rented my property. The property directly next door has just been demolished and the pilings for the new home were being driven into the ground the dayvthese guests arrived which must have driven the mouse inside the house. We took care of that unwelcome visitor immediately. I didn’t know about their concern regarding the second floor shower but I use that shower personally and the temperature control works perfectly. I would have demonstrated the controls to the guests if they would have raised the issue while I was at the property for the mouse issue. I make myself available 24/7 to address any and all of my guests questions/concerns and if needed I can be at the property within a very few minutes to address any issues personally. Dan made us feel so welcome! The house is equipped with anything you can think of, beds are comfortable, home is so spacious that we were able to break into small groups for conversations. For the most part, we all gathered in the bright and cheery kitchen, sharing cooking duties. Room for everyone to pitch in! Dan was very accessible throughout the rental process, replying to questions within a few hours at most. I would highly recommend this property as a gem in Ocean City. To top it off, Fall Block Party fireworks were visible from both ocean side balconies. Perfect!!! Ocean City NJ is approx. 20 minutes from 9 of the world most renowned casinos, live entertainment and fine dining of Atlantic City. This spectacular home is one block from the beach/boardwalk of America's most premier family resort as it was voted the past five years. We are a short walking distance to nearby amusement parks, water park, shopping boutiques along Asbury Avenue and many wonderful family-friendly restaurants. All possible water sports are located a short bike ride away at the bay along with all activities associated with fishing and boating. Please check calendar for availability.